There is just nothing better than banana combined with chocolate! Banana and chocolate are always are winning combination! These delicious little muffins make these two ingredients just melt together into perfection. A batter flavored with banana just engulfs little small pieces of melty chocolate. Especially because I’m not the keenest baker I often rely on small little cupcakes to treat my guests. Cupcakes are just easy to make and require less attention to detail compared to bigger and more intricate cakes. Just combine the ingredients into the batter while making sure not to over-mix it. Then place a big ol’ spoonful into the molds of the muffin tray and bake to crispy fluffy perfection! I used Oreo-filled Milka chocolate for the recipe, but every chocolate will do. These little muffins are a real sweet treat and milk chocolate works better in my opinion than the slightly bitter dark chocolate. Even though I’m using self-rising flour I also added baking powder. This gives the cupcakes some extra lift and makes sure they fluff up into the perfect muffin shape! What are you waiting for? 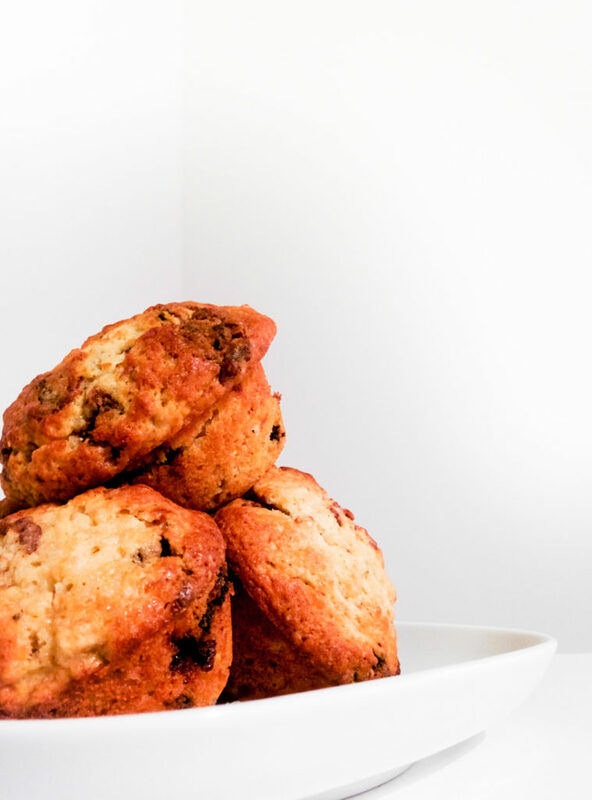 Make some delicious indulging banana chocolate muffins! Preheat oven to 190°c (fan works best). Butter the muffin tray so the muffins won’t stick. Add the vanilla sugar, regular sugar, salt and yoghurt to the butter. Peel the bananas and break into pieces. Mash the banana pieces to pulp and add to the butter. Break the eggs into the butter as well. Mix all the ingredients until very well combined. Chop the chocolate into small pieces and add to the butter mix. Add the flour and the baking powder to your batter and mix until just combined. Don’t over-mix! Divide the batter across the muffins tins. Put your muffin tray into the oven and bake for about 20 minutes. Ovens and muffin-trays differ a lot, so please check regularly after 15 minutes how much the muffins have browned! Let the muffins cool completely on a wire rack, before digging into your little delicious perfect cakes! What is your favorite muffin recipe? Do you think that there are ingredients that are even better combinations than banana and chocolate? Place your suggestions in the comments below and let’s try to find the best muffin combination of all times!